Concrobium Mold Control is an innovative, market-leading product that effectively kills existing mold, prevents mold re-growth and eliminates musty odors with no harmful chemicals. The unique technology is used by homeowners, professional remodelers, contractors and remediates. The large format 3.78L Jug is ideal for large-scale jobs like remediating a basement or attic that has experienced moisture and mold damage. Use the 1 gallon format along with our cold-fogger to pre-treat new building materials against future mold damage quickly and safely. Click here to download a copy of the back label. Large spaces e.g., entire rooms, basements, cellars; hard-to-reach areas e.g., attics, crawlspaces, wall cavities; new construction sites e.g. closed houses. Drywall, wood, composite wood, plastic, concrete, siding, shakes, metal, brick, stone, tile, grout, stucco, fabric, furniture, upholstery, flooring, and many more surfaces. 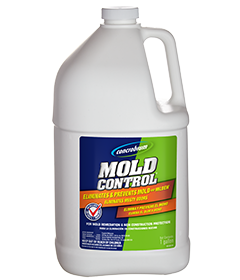 Concrobium Mold Control effectively eliminates and prevents mold with no bleach, ammonia or VOCs. Concrobium works as it dries by crushing the mold spores at the roots and leaving behind an invisible antimicrobial barrier to prevent future mold growth. Apply Concrobium Mold Control in a thin, even layer over the affected surface. With a Concrobium dampened cloth or brush, scrub the surface to clean away any remaining mold stains and residue. To protect against future mold growth, reapply Concrobium Mold Control on vulnerable surfaces.